64th Filmfare Awards are just a few hours away. This year, the good movies and performances might not have been in abundance. But there were certainly enough show stealers to fill up the spots in the nominations list. We do feel that some movies and actors were snubbed from the list, but we have already talked about it in an article before. Before we officially get to know who bags the most sought out award of the year, we thought we'd make a prediction. We hereby announce our picks for the main categories of the Filmfare Awards 2019. Please don't bash us if they don't match with your choices. Please do notice, that this year there have been more small budget movies that have been nominated than the big budget ones. Padmaavat, Zero, Sanju are the only ones from the made-on-lavish-scale that made the cut this year. So, let us begin. Who will win: Hands down, Badhaai Ho is going take this one home. The movie was such an unexpected entertainer. And after a long time, we got to see a wholesome comedy that we could sit with the family and watch. And even learn a thing or two, maybe. Who will: Sanjay Leela Bhansali might bag this award for Padmaavat. The amount of hard work that has gone into making this movie transpires on screen very well. Who will win: Andhadhun and Manto are the top contenders for this spot. And we won't be surprised if Filmfare would announce it to be a tie. Who will win: A Filmfare win for Ranbir Kapoor has never been more deserving than this ever before. The masses loved the actor's performance in Sanju, where he essayed the role of controversial Bollywood star, Sanjay Dutt. 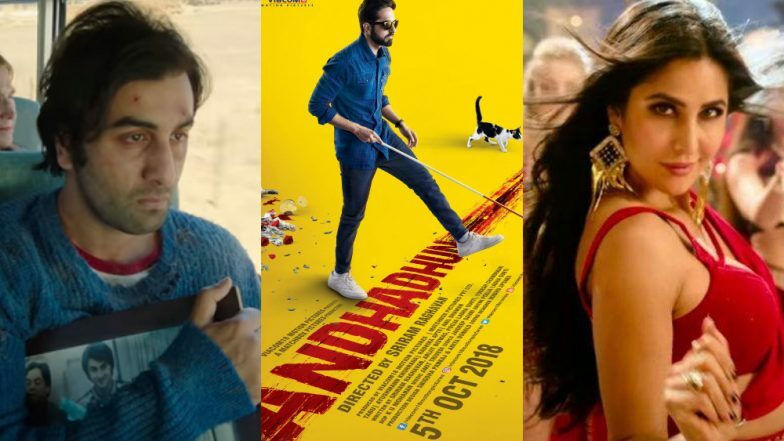 Who will win: Andhadhun; the movie has managed to impress the critics and the audience alike. The Ayushmann Khurrana starrer was one of the surprise hits of the year and the buzz around is very strong. While the popular awards might tip more into the favour of Sanju, critics better pick Andhadhun. Who will win: Alia Bhatt carried Raazi on her shoulders. She gave the best performance of her career in the film. Who will win: If Neena Gupta doesn't win this award for Badhaai Ho, a lot of people are going to be upset. We totally think she will bag this one. Who will win: It will be a tough call between Pankaj Tripathi and Vicky Kaushal, but the needle would be tipping more in the favour of the latter. Watch Vicky bag the award for Raazi. Who will win: This one is going to be so tricky. Katrina and Surekha might end up sharing the award. But, with a gun to the head, if we had to pick just one, then Katrina is sure bagging this one. Who will win: Ajay Atul are totally taking home a trophy for Dhadak. So, those were our predictions as to who will win trophies at the Filmfare Awards 2019. The Filmfare Awards will be held on March 23 in Mumbai. The who's who will be attending the event and we are going to see some stellar performance.